The trucking industry is seeing the best economic climate since deregulation, according to Bob Costello, chief economist and senior vice president of the American Trucking Associations. Speaking at the opening session of Omnitracs’ Outlook 2018 user conference in Nashville on Feb. 26, Costello said the trucking industry should face smooth sailing over the next year or two. “This is a growing environment,” he said, noting that the economy is in its third-longest expansion in history— which is on track to becoming the second-longest by springtime. From a macroeconomic view, the two key drivers are productivity and population growth, he said, with those two indicators suggesting GDP growth of about 2.3%. Instead, the economy is chugging along at 2.7% growth and should remain there for the next couple of years. Part of what is boosting GDP growth can be attributed to the new tax law, he said, but other factors are also playing a role. Even higher interest rates don’t bother him, Costello said, noting that the Federal Reserve was expected to increase rates 4 times this year. Interest rates have been very low and the increases are just “normalizing interest rates. I believe a higher interest rate can add to the economy in the near term.” Banks will be more likely to make loans if they can get better returns. Costello pointed out three “big buckets” and one smaller one that he said drive freight growth: consumer spending, construction, factory output, and inventory levels (the half bucket). And for the first time during this expansion, all three of the big buckets are doing well at the same time. From the consumer perspective, the economy has created over two million jobs a year for six consecutive years. That puts us very close to full employment, which makes it harder for companies to find workers. That, in turn, leads to wage and salary increases. He estimates wages and salaries will grow by 3% this year. Higher wages lead to more spending. “For most households, the extra money that comes in the door, goes right back out” in spending, he said. As a result, Costello expects personal consumption to grow 4.6% this year and 2.5% in 2019. But even though “we are spending more money, we are not spending it in the same places,” because of the increasing role of online sales, which have grown 246% since 2000 as opposed to 78% growth seen in traditional brick-and-mortar stores. As a percentage of traditional sales, online sales are now 16%. All of that has ramification for the supply chain, he said. The second bucket of freight, construction is also going well. He estimated there could be 1.3 million new homes built in 2018 and 1.4 million in 2019. There were 1.2 million new homes in 2017. All of that leads to more trucking. Increased automation increases productivity. On the other hand, automation does have implications for the broader economy – more machines doing the work means fewer people are needed. “But at the end of the day, productivity has improved which will generate a lot of freight,” he said. As for the half-bucket, the inventory-to-sales ratios are also looking good, Costello said. When that ratio rises, trucking slows; when it drops, trucking improves. But if it falls too far, there is a capacity crunch and suppliers have trouble keeping shelves stocked. But the optimum level for inventory/sales ratio has moved up a bit due primarily to e-commerce. Customers expect to get their online orders within a couple of days, therefore retailers are holding more inventory because they have more distribution centers around the country. But even with the higher inventories, they are cycling through time more quickly. And while “we’ve not had it so good” in some time, it could derail. “What could de-rail it? Some policy choices could,” he said, such as going to war with North Korea or pulling out of NAFTA. Costello argued it is not NAFTA that has impacted U.S. jobs, but rather China. He pointed out figures that show that from 1994, when NAFTA was signed, until 2000, U.S. factory employment increased by about 500,000 jobs. In 2000, China joined the World Trade Organization. That combined with increased automation costs 3.9 million jobs between 2000 and 2007. As for trucking and its segments, the growth rate in truckload was 2.9% in 2017 after growing at .1% in 2016. Between 2000 and 2014, it averaged 2.6%. On the other hand, total miles are down – more loads but less miles. The average haul is now around 527 miles and most fleets struggle to get 100,000 miles per tractor now. Some of that is due to the changing supply chain from e-commerce with more distribution centers. LTL tonnage is also trending up, growth rate was 1.5% in 2017. Rates are also trending up, especially in the spot market. Contract rates have grown at a more modest, but steady rate. Driver turnover is still a problem with truckload carriers, at 95% in 2017. Turnover in LTL remains steady at about 8-11% since 2009. He said that at current trends, the industry could end up short 174,000 drivers in coming years. All in all, as Costello presented it, trucking has it well. Utter the words training and communicating in the same breath, and what you may hear calling back to you is the word perception. To some degree, we all perceive our intrinsic worth to family, friends, colleagues, and yes, to employers, by what we hear back from them. In the workplace, that generally translates to whether or not we feel valued or appreciated as employees — and as career professionals. The best employers in any field go beyond merely providing training. They help employees improve their skills. And regardless of the job being performed, technology is increasingly playing a positive role to help employees develop their full potential on the job. Put that all together (along with a competitive pay package, of course), and you may be looking at a successful strategy for attracting and retaining long-haul truck drivers. First, ask yourself if communication is the problem to the answer. That is, who at your fleet should be doing their level best to interact positively with drivers? Being a good communicator is certainly not the sole province of a fleet’s driver trainers. Everyone who regularly interacts with drivers should communicate with them as positively and pleasantly as possible. With that in mind, Judge suggests several ways to key in on your veteran drivers. For starters, don’t treat them like newbies. Consider creating specific communications that reflect their level of experience, focusing on topics such as bidding preferences and the value of employment benefits. There should also be incentives and awards tailored to recognize them, such as million-miler programs. Superior, Wisconsin-based Halvor Lines, which runs over 430 tractors and a mixed trailer fleet of vans, reefers, and flatbeds, boasts a driver turnover rate of 38.5% and low CSA scores. Adam Lang, the truckload carrier’s chief risk officer, credits those high marks of success to Halvor’s late-model equipment, driver wellness program, and the commitment of management to fostering a culture of safety. Lang says Halvor has “evolved” its training approach by going beyond hands-on instruction to incorporate online learning technology. “We use CarriersEdge training modules during orientation and for continuing driver education.” He says prior to adding the online component, Halvor had new drivers watch up to five hours of safety and training videos during orientation. “That checked off the box,” he says, “but it doesn’t mean they absorbed it. But we find they retain information after going through the CarriersEdge orientation modules.” That online instruction covers C-TPAT and Security and Threat Awareness topics and includes tests that engage the drivers, so they just don’t listen but learn the material. Out on the road, CarriersEdge provides continuing education to Halvor’s drivers. “If we see a skill that needs addressing, we can assign from a list of the training modules,” Lang says. “Drivers can use their laptop or tablet and complete the module when it’s convenient. We monitor how they are doing and record their progress.” Halvor can also upload its own material to the CarriersEdge web portal, such as refresher courses for in-person training drivers have completed. But while online training is a great use of technology, he cautions that “it’s not everything. You still need the practical coaching on the road, and the classroom components with its social aspect, to have a complete training program. We provide a library of generic content and the tools to track all elements of the fleet’s training.” He says the training content runs the gamut from dealing with regulatory compliance issues to developing softer skills, such as how to respond at an accident scene or the steps involved in border crossing. 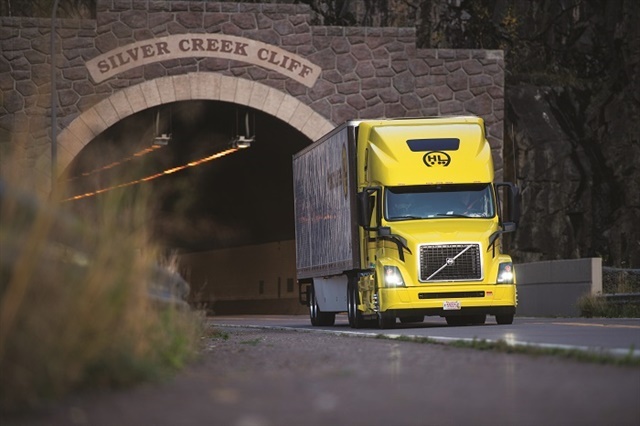 Recent research by PIT Group, a third-party engineering organization, shows that driver training to boost safety or fuel efficiency is only effective when it includes refresher courses. Separate studies it conducted of groups of truck and bus drivers found that providing refresher training and coaching via in-vehicle technology that address bad habits and reinforce effective skills is needed to maintain and improve performance. In one fuel-efficiency study, PIT Group compared 47 control group and 38 test group long-haul drivers before and after simulator training. After training, evaluations were performed at one, three, six, and nine months. According to PIT Group research leader Jan Michaelsen, thanks to close monitoring and communication with drivers, including frequent reminders of how they were performing, the test data show that drivers operating a truck an average of 156,000 miles per year could save 2,640 gallons annually. “In-cab coaching can be seen as continually empowering drivers who want to perform better,” says Ed McCarthy, vice president of operations and customer success for Vnomics. The firm provides the True Fuel stand-alone system that combines vehicle monitoring, fuel-use analytics, and real-time driver coaching to help lower fuel consumption. “Our True Fuel in-cab tool provides gentle coaching on how to drive in the most fuel-efficient manner. And it does so by focusing only on what the driver can influence, not what he can’t control like loads and roads.” The system coaches by sounding tones when the driver gets outside the most fuel-efficient range of operation. Technology comes into its own for training when it’s used to “deliver consistent content across a company and does so smartly — not by shots in the dark,” says Laura McMillan, vice president of training program development for Instructional Technologies Inc., which provides Pro-Tread online training as well as safety consulting services. Pro-Tread programming is based on mastery-based training, which uses quizzes and repetition of key points to foster retention. The idea is that by illustrating an idea visually, verbally, and through interactions, different types of learners will grasp it. This type of training can also be highly customized, McMillan points out. “Setting up training is a collaborative effort with clients. We spend time with them up front to identify their top 10 safety incidents and then set up the content lesson for performance improvement. We help them understand using their data to identify what content to push out to drivers at which time.” The fleet controls all time frames for training, such as quarterly or bimonthly for refresher units, with the content automatically launched. But remedial training can be pushed out after an incident or accident has occurred. Since the federally mandated electronic logging device (ELD) mandate took effect near the end of 2017, the subsequent impact on the truckload shippers and carriers, as was expected, has been fairly bumpy on various fronts. That was a key theme in a Logistics Management reader survey of 349 freight transportation and logistics stakeholders. Since the federally mandated electronic logging device (ELD) mandate took effect near the end of 2017, the subsequent impact on the truckload shippers and carriers, as was expected, has been fairly bumpy on various fronts. That was a key theme in a Logistics Management reader survey of 349 freight transportation and logistics stakeholders. The Federal Motor Carrier Safety Administration formally announced in late 2016 that the federal mandate for ELD for commercial motor carriers was official and would take effect in December 2017, basically confirming the inevitable in some ways within the freight transportation and logistics sectors. The objective of the rule, according to FMCSA, is to strengthen commercial truck and bus drivers’ compliance with hours-of-service (HOS) regulations that combat fatigue. ELD automatically record driving time and monitor engine hours, vehicle movement, miles driven, and location information. Many trucking observers have long maintained that the need for ELD is obvious, with most explaining that the industry has been reliant on paper logs for far too long. And there were perceived economic benefits through ELD usage, too, as observers said it could likely reduce the effective number of miles a driver could log, further tightening trucking capacity at a time of ongoing limited truck driver supply, rising pay, and higher overall fleet costs. Of the 349 survey respondents, 84%, or 293, use full truckload shipping services. When it comes to securing truckload capacity since the ELD mandate took effect, the survey found that 57.7% of respondents, or 168, said it was sometimes a problem, with 26.8%, or 78, saying it was usually or always a problem, and another 15.5%, or 45, not being impacted in their ability to secure capacity. Some of the challenges related to securing capacity included familiar obstacles like: the ongoing driver shortage and tight capacity, confirming tendered offers, and carriers not accepting loads if they are afraid to time out before pick up, as well as other things like increasing rate pressures brought on by the ELD mandate, with shippers saying getting carriers to accept loads at contracted pricing levels. Given these challenges, and others, it is not surprising that 67%, or 231 survey respondents, indicated that the ELD mandate has led to an inability to secure capacity, with another 29%, or 101, saying there has been no change, and a mere 4%, or 13, noting that things have been fine. Some steps being taken to counter these challenges and secure needed capacity cited by respondents include building strong carrier relationships and not counting on load boards, with some saying that they used carriers that they only use carriers that had ELD in place prior to last December. Perhaps the most telling part of the survey is its takeaways relating to ELD-impacted freight rates, which saw a modest level of variation. The highest grouping was the 27.4% of respondents pointing to rate increases of 15% or higher, with another 21.5% saying rates are up 11%-15%. The largest rate gains were noted with 38.5% of respondents citing an uptick of 5%-10%, with 12.5% of respondents saying rates rose by less than 5%. Taking the rate focus one step further, 83.9% of respondents said their rates were higher than a year ago, and 16.1 saying they were not. Addressing the impact of ELDs on the trucking market, trucking expert Noel Perry of Transport Futures observed in a Cowen and Co. research note that productivity and capacity have been impacted going back to last fall, while also noting that there will likely be a significant reduction in productivity as the adoption percentage of ELD rise, which he said will happen by April, when the “soft ELD enforcement period” ends and carriers can then face fines or be removed from service for a period. Mike Regan,Chief Relationship Officer for TranzAct Technologies, pulled no punches when how the ELD mandate has affected the trucking market. “The impact of the ELD mandate so far is every bit as consequential as people thought it would be, and the impact to date as people get assimilated to an ELD environment is more significant than was anticipated,” he explained. Regan said the big impact is not being seen with rigs being pulled off the road, but with former one-day lanes having now become two-day lanes, which has led to a situation in which drivers that were previously making 500 mile runs that are now taking two days, as they don’t want to run the risk of being fined. On top of that, Regan said this creates a situation that sees drivers and carriers needing to assess their parking situation, as they reach the end of their allotted cycle on their lanes. Hundreds of truck drivers are expected to gather in Pennsylvania in May to raise money for children with serious illnesses during the 28th annual Mother’s Day Truck Convoy. Make-A-Wish is hosting the convoy on May 13th at Burle Business Park, which is located at 1054 New Holland Avenue, Lancaster, Pennsylvania 17601. Last year, 595 trucks participated in the Mother’s Day Convoy — and this year the event sponsors hope that 600 truckers will sign up to participate. Grounds will open to drivers at 6:00 am, and to general public at 8:00 am. The convoy leaves Burle Business Park at 1:30 pm. Convoy Drivers are encouraged to make the $100 minimum donation either by check payable to Make-A-Wish, 1054 New Holland Ave, Lancaster, PA 17601 or by making an online donation to their fundraising page. Driver registration includes a t-shirt and a driver gift bag. Registration must be received on or before Friday April 13th to guarantee a t-shirt. Printable donation collection forms can be found here. Burle Business Park is for TRUCK PARKING ONLY. All others are asked to park at either Grandview Plaza on New Holland Avenue or Lancaster Catholic High School on Juliette Avenue. There will be a shuttle running continuously from both locations to Burle Business Park and back. The foundation needs the Convoy to cover the cost of 50 of the more than 75 wishes it will grant in the Susquehanna Valley this year. Please join them as celebrate those 50 wish children and their families by telling their stories. Tune into the Make-A-Wish social media channels and check back to their website to read about the wishes they already funded and the ones we are working on. You can read about those wishes HERE. In 1990, a young man named Matt requested a wish to ride in an 18 wheeler and speak to his sister on a CB radio. Over forty trucks and drivers showed up to grant the wish and, under the guidance of the late JC Hale, the Mother’s Day Truck Convoy was conceived. For the past 28 years, the event has been held on Mother’s Day in Lancaster, PA. Over the years the number of trucks has grown to over 500 with over 100 wish children as passengers riding each year. The event draws approximately 5,000 people to Burle Business Park to see the trucks, attend an auction, play games, and enjoy delicious local food. Another 25,000 people line the 26 mile route to cheer for the trucks and wish children as they pass by. You can check out video from last year’s Mother’s Day Convoy below.